# Default MAMP password is root - but you changed it right? /Applications/MAMP/Library/bin/mysql -uroot -p -e "create database magento1501"
# If you're paranoid about security, I suggest a better password for your Magento database than 'password'. /Applications/MAMP/Library/bin/mysql -uroot -p -e "grant all on magento1501. * to magento1501@'localhost' identified by 'password'"
# Default MAMP password is root - but you changed it right? /Applications/MAMP/Library/bin/mysql -uroot -p -e "create database magento1501" # If you're paranoid about security, I suggest a better password for your Magento database than 'password'. /Applications/MAMP/Library/bin/mysql -uroot -p -e "grant all on magento1501. * to magento1501@'localhost' identified by 'password'"
Right, we have the files and a database, let’s run the Magento install. /Applications/MAMP/bin/php5/bin/php -f install.php -- --license_agreement_accepted "yes" --locale "en_US" --timezone "America/Los_Angeles" --default_currency "USD" --db_host "localhost" --db_name "magento1501" --db_user "magento1501" --db_pass "password" --url "http://127.0.0.1:8888/magento/1.5.0.1/" --use_rewrites "yes" --use_secure "no" --secure_base_url "" --use_secure_admin "no" --admin_firstname "max" --admin_lastname "power" --admin_email "ashley.schroder@gmail.com" --admin_username "admin" --admin_password "password"
If it worked you should be able to get to the default Magento start page here: http://127.0.0.1:8888/magento/1.5.0.1/ (or where ever your web server’s doc root is). For SVN I use the CollabNet SVN packages, you can install them easily like any Mac app. Try to fight back the gag reflex that comes with a login-required download. Once you have SVN installed you’ll want the latest Modman script (1.1.1) too. Optional tip: You can use something like export PATH=$PATH:/Users/yourname/bin/ in your ~/.bash_profile to set up a local bin folder. it’s also a nice place to put symlinks to the various MAMP binaries. So get onto one of those sites, or your preferred alternative and sign up for a repository. 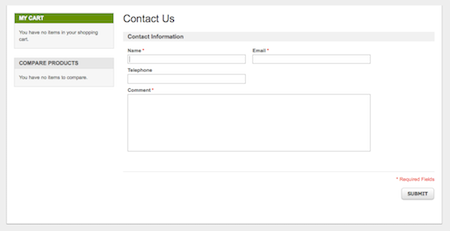 In the coming steps we’ll need a repository URL and a username/password. Finally, must be nearly smoko time! We’ve installed Magento, Modman and SVN. We set up a SVN repository. Now we can get started with some Magento development! Slight detour first to make our skeleton Modman project and check it in to our repository. This is a good opportunity to flush out SVN issues before we get into the nitty gritty too. You can run these commands from anywhere. Now, if you’re putting multiple store projects into one repository you might like to name your project after the store so make a directory for each one like this. The @shell thing is just a simple way of making a sort of ‘Hello World’ Modman project. svn ci -m "initial import of acmewidgets.com store project" . # If you see Committed revision X then it probably worked! mkdir acmewidgets.com echo "@shell echo 'Hello World'" > acmewidgets.com/modman svn add acmewidgets.com svn ci -m "initial import of acmewidgets.com store project" . # If you see Committed revision X then it probably worked! Now we initialize Modman in the root of our Magento store. As an aside, Modman is well documented so you should check out the project wiki. Ok so far so good, we now have all the Modman functionality in place, and a skeleton project in our repository. 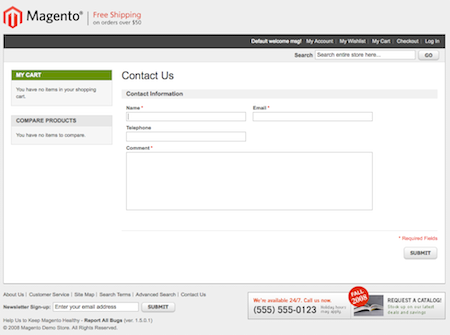 Let’s add some useful Magento functionality to our project. At this point you can actually fire up your favorite IDE and map a SVN project to the folder .modman/acmewidgets.com and a new project. It’s also a good idea to map in the core code, but only for reference, not to change! If you do create an IDE project then you would add the below folders using the IDE, but I’ll keep going with the command line for transparency and simplicity. What we are setting up now is the various parts of Magento that we want to have Modman link into the appropriate places in the Magento install. We’ll start simple with a new theme and a local override directory ( I have a feeling we’ll need this in Magento 1.5.0.1…). # We'll base it on the modern theme, for better or worse. You need to add contents as follows to the modman file – these map the project directories to their Magento store counterparts, Modman will manage the linking process for us. The syntax is described on the Modman wiki. # Keep the Hello World in here, for the benefit of the tutorial. Save the changes to the modman file and then check they work. Update of module acmewidgets.com complete. At revision 1. Created link: theme/design app/design/frontend/default/acme Created link: theme/skin skin/frontend/default/acme Created link: local app/code/local Hello World Update of module acmewidgets.com complete. Let’s check this in and send the changes to our Production Magento environment. Remember that all of these steps are probably best done in an IDE, I have shown them on the commandline only because I think it’s more transparent than a bunch of screnshots from a GUI. Now we can bring our Magento store project to the Production server and test it has worked. I’ll assume you already have a fresh 1.5 Magento running on your production server. You should also install SVN and Modman. For a Linux server installing SVN should be easy-peasy, the Modman instructions I gave earlier for Mac are largely transferable, make sure you put the script somewhere sensible for running it in your environment. First go to the root of you Magento store and grab the Modman project we setup. Modman will take care of the rest for us. Note: If this is your honest-to-god production Magento store DON’T DO THIS YET, as part of the tutorial things will not go well. Just read, don’t run this. And now we can set the store theme to acme in the Magento admin and we should be presented with a copy of the modern theme running at acmewidgets.com, awaiting customization. Right? It is a reported bug with a working patch, we just need to apply it. This last step just shows how you can actually go through a development-deploy cycle. Thankfully we have an excellent use case: fixing this bug which affects Modman. Back on our local development computer we need to apply this fix as a local code override. Now check in our changes. …and deploy them to production (after you have tested locally and are satisfied with the results, of course). Now we should see the modern theme we were expecting! That is how you can make and test changes locally, and then deploy to production (or staging). Phew, this turned out to be a bit of a monster post, if you’re still with me, Well Done for sticking with it. I hope these steps help a few people set up a structured Magento development project. I’ll continue this series with some simple little tips to build on this setup like; clearing your Magento cache after a deploy, installing extensions via Modman. If there are any topics in particular that you’d like, let me know. If you spot any errors or have any trouble following these steps please let me know in the comments. If you want to send praise to the creator of Modman (and you should, it’s an excellent tool) Colin can be reached at his blog. If you have any ideas for improving this setup I’d very much like to hear them. Likewise if anyone has steps for using Windows, or Git then I’d gladly add them here for completeness. Stay tuned for more information like this. Sweet, I thought I saw that item in the release notes this morning, but they hadn’t updated the bug so I was a little confused. Not sure I agree that it needs to be a config switch, but hey, it’ll save a core override, so I’m happy. 1) How do you manage changes to the development database and production db? Especially, e.g., if you make configuration changes in development, how do you track all those changes to push to production? 2) Magento upgrades. You note in another post that all of this will hopefully result in a less painful upgrade process. What’s been your experience? How do you go about upgrading to new releases? Question – when you do your initial ‘svn co’ in Step 3, should that be in the ~/bin directory (where Step 2 left off) or in the localhost root directory or in the Magento root directory? Hi, so good to hear from someone following the steps! That initial checkout can be done anywhere (I did note that actually!) because it’s really just setting up the skeleton repository and checking it in, you can delete it afterwards if you want. The real svn co happens via the modman script in the next set of commands. Thanks for the tutorial! Got a nice little local workflow set up with Magento 1.5.1.0 thanks to this and your MAMP articles. and then you don’t need the code tweak. I also want to point out because it wasn’t clear to a moron like me that modman also allows you to symlink files, not just folders. Which is what you’ll want to do with your app/etc/modules xml file so that you don’t overwrite the ones already there. Thanks for the feedback Steve, good tip about Developer Mode, that’s new in 1.5.1.
what about on windoze 7 ? Thanks for the tutorial! It is nice little local workflow set up with Magento 1.5.1.0 thanks to this and your MAMP articles. Thank you for new trick specially /Applications/MAMP/bin/php5/bin/php -f install.php part of installation.